Summary: The JLL IC600 Indoor Bike is the top end of the impressive range of spinning bikes from JLL. This is a popular make, which I’d describe as popular mid-range equipment aimed at home users. 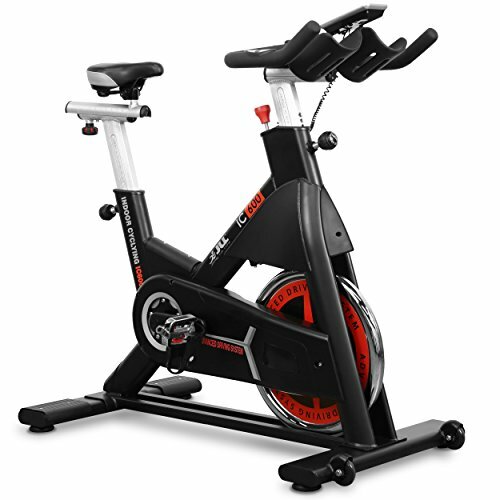 With the IC600 spinner, JLL have upped the spec – this exercise bike is plenty good enough for a commercial gym. The design is stunning, and the bike is powered by a 22kg 2-way flywheel and packs a punch in the electronics setup too. Check out the full picture gallery and find the latest discount on this dedicated amazon.co.uk product page. You’ll get a solid bike, which could not be further from the rattly budget models you find these days. This weight in at a robust 70.5 kilograms. Some assembly is needed as always, though the main parts are all assembled. There are wheels on the front stability bar, so it can be moved around. The IC600 is 112x 61x 122cm – and has that squat spinning bike look to it. I love the angles, and the black / red design. There is more to this bike’s construction that just good looks. It is fully adjustable (with 12 seat positions and adjustable ergonomic handlebars). It supports users of all sizes, with a 150kg recommended maximum weight – that is more than 23 stone in ‘old money’. JLL built this bike to be smooth and powerful. Flywheels make a big difference, and this one packs a punch with a 22kg flywheel. You might notice this is ‘2-way’, that means you can peddle backwards! The IC600 spinner uses brake pad resistance and transfers your pedalling efforts through strong rubber bands. The crank is 3 piece – just like you’ll find on a real bike. Ergonomic handlebars include a dial which is easy to reach for upping (or lowering) the resistance while you cycle. Instead of multiple small numbers, you get a single display. This shows you everything you need to know about your workout. This includes the usual speed, distance and calories burned. You can also measure your pulse rate while spinning. There are two sensors, one on each of the handlebars. These are placed in the natural position you’ll be cycling in – so no need to adjust position to find your pulse. A couple of extras to note. There is a bottle holder (we all know spinning can be thirst work! ), and the IC600 exercise bike comes with a generous 24 months warranty that covers both home and commercial uses. Not too much feedback to go on for this newer model. I will update when more arrives. The two users who have left feedback at the time of writing were very happy with their choice. One left the caveat that they will see how it stands the test of time! In general, JLL have great feedback both for their product line and their service. That 24-month warranty shows they are committed to their customers – try getting that for a cheap Chinese knock-off! Wrapping Up: Top Quality Home Spinning – or Commercial Use, You Choose! This is the first time I have seen JLL burst out of the solid home exercise bikes market and produce a product which is good enough for a commercial gym. This is a solid bike, that makes a lot of budget models look like toys. I love the looks and the spec is high-end. That 22kg flywheel certainly packs a punch. This bike is for home users who want something closer to what you’ll find in the gym and want it at a good price. Check out the pics, latest discounts and feedback for yourself now on this dedicated amazon.co.uk product page.